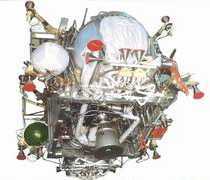 Yuzhnoye N2O4/UDMH rocket engine. RT-23 MIRV-bus. Out of Production. Engine consisted of two turbopumps with gas generators and two feeders; a single chamber main engine; and 16 liquid thrusters for attitude control and translation. AKA: 3D65. Status: Out of Production. Date: 1980-83. Thrust: 5.20 kN (1,169 lbf). Unfuelled mass: 125 kg (276 lb). Specific impulse: 306 s. Burn time: 330 s. Height: 1.19 m (3.89 ft). Diameter: 1.98 m (6.49 ft). The multifunction engine operated under a generator scheme. Propellants were fed under a combined scheme (pressure-fed and pump delivery). A broad range of flow-rates and pressures were provided according to the engine mode. The engine consisted of a centralized propellant supply source composed of two turbopumps with gas generators and two feeders; a single chamber main engine; and 16 liquid thrusters for attitude control and translation. Overall vacuum thrust of between minus 926 KN to plus 5036 kN could be provided at a mean specific impulse of 305.5 seconds for the design dispensing profile. The thrusters could be fired in continuous or 10 Hz pulsed modes. Summary: One main and 16 control thrusters. 5.20 kN + 16 x 116 N. Chamber pressure 40.7 / 5.56 bar. Specific impulse 305.5 / 245 sec. Burn time 330 / 1200 sec. Oxidizer to fuel ratio 2.03 / 1.85. Chambers: 1 + 16. Engine: 125 kg (276 lb). Chamber Pressure: 40.70 bar. Thrust to Weight Ratio: 4.22. Oxidizer to Fuel Ratio: 2.03. Family: Storable liquid. Country: Ukraine. Launch Vehicles: RT-23. Propellants: N2O4/UDMH. Stages: RT-23-3. Agency: Yuzhnoye. Bibliography: 330, 344, 348, 97.